“Jailbreak Detection” is a set of checks, mostly performed by Mobile Device Management solutions like MobileIron / Good Technologies or other third party Apps to determine if a device is jailbroken or not. It checks if all security controls of Apple’s iOS are still in place and if we can / should / want “trust” this device. To know if a device is jailbroken is very important as it should never be the case that a jailbroken device can access services from the corporate environment like email or document management systems. 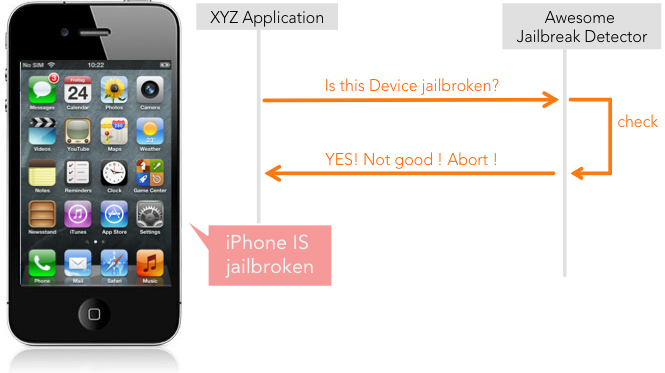 Apple itself introduced a jailbreak detection API ready to use for third party developers, but dropped it quietly with iOS 4.2. The reasons remain a mystery. I think Apple was aware of the fact that such an API can never work by design and dumped it for liability reasons: Software is supervising other software, telling it the device is jailbroken … and software can always be manipulated. In this case by disguise the fact that something has been compromised. The idea is simple: write a malware that will “Hook” the original code and bypass the detection. to erase data and disable remote resources. Other solutions may be to implement the detection as static inline C code, which is much harder to manipulate. 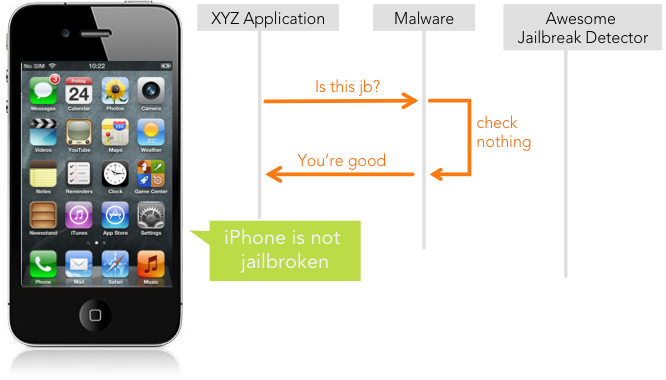 To summarize this post: Jailbreak detection is valuable and it should definitely be a part of your tool-set to secure integration of mobile devices into the company. However, it should not be trusted blindly. Really nice write up on how it could work and what you can do. Great Friday afternoon reading.